Navigation Tabs can be organized automatically basing on the folders that exist in the root of your Plone site. : tick a box Automatically generate tabs and all the published folders that are there in the root will be displayed in Navigation tabs (like in a picture above). Breadcrumbs - are little lines, that also show where you are on site. Sometimes it's the easiest way to see where you are (if navigation tree is done so that it doesn't display all the levels). 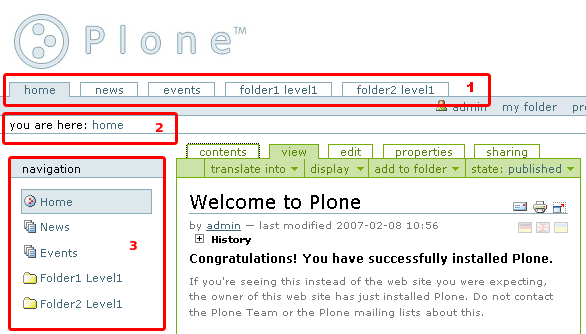 Plone 3.0.x - Site Setup -> Navigation and Manage Portlets -> Navigation Portlet. Navigation tree can display all the documents that are on site. If you want only the contents of the current folder to be displayed in the navigation tree - tick the box. Navigation settings allows you to make different combinations of what navigation tree displays: whether these are all folders or just those, of the exact level. Let's discuss several possible variants of Navigation on this Plone site. Hi, first of all thanks for the info. I have an issue with the navigation portlet on Plone 3. Everything works fine as long as the folder I wish to expand is located at the root of the website; at this level I can create subfolders and see the corresponding levels in the navigation tree. However when I go in the Members folder nothing happens. The navigation portlet stands still as if I was still at the root of my site. This is pretty annoying as I would like to use my site to share users' documents and use the navigation portlet to browse its contents which will mostly be located in this folder. Can anybody help me with this please, Thank you in advance. Fabien. Hello Fabien, I'm trying to reproduce your issue: You have one folder (let's call it Example Folder) with several subfolders in the root of your site. You also have Members folder in the site root. Is it right? As far as I understood, the problem is that you need to have Example Folder be displayed in the navigation tree when you are in the Members folder (you need to have Example Folder be displayed the navigation tree no matter where on site you are), don't you? 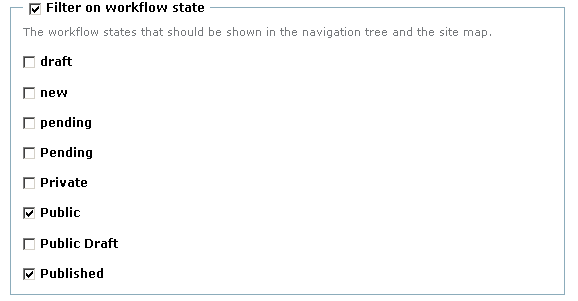 Now you will have navigation tree, displaying site root objects be displayed everywhere on your site. Hope it will help you. Olha. Is it possible to set these parameters you have described above in a theme product or as part of buildout? I would like to use the navigation portlet instead of the global_sections bar. Hi -- thank you for the really helpful post! 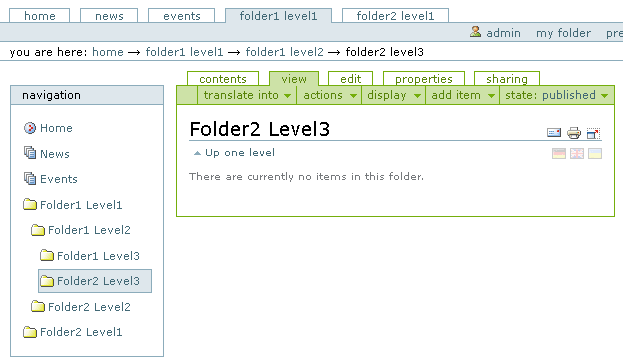 Is it possible (in Plone 4) to change the order in which the folders appear in the navigation tree? yes, it is possible to change order of folders in the navigation. 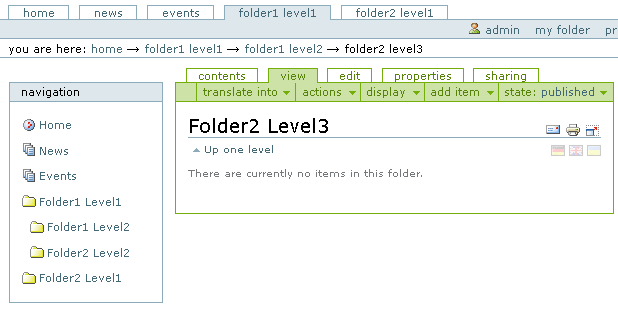 For this - go to folder_contents view and move folders up/down to make them in the order you need.